I just completed this 8′ classic rod based on a Paul Young design. The rod has two tips; a 7 weight and a 6 weight tip. Providing some additional flexibility. The uplocking reel seat is made of Bocote wood. The rod includes an agate stripping guide and olive wraps. I am getting started on a new rod that should be a great rod for bass fishing. It’s a Paul Young design – Para 15. I’ll be making two tips one designed for a 6 weight line and one for a 7 weight line to give a little extra flexibility. For this rod I decided to flame the bamboo. This will provide a deep caramel color finish. The flaming is a pretty simple process involving lightly charring the outside of the bamboo with a torch. Once the bamboo is flamed I began the splitting process. Consecutively splitting the bamboo down into stips which will then be planed down into the final taper. Once the bamboo is split, the strips are hand planed to approximately 1/4 width. The nodes are filed and pressed and the strips are prepared for the initial rough planing and heat treating. Then the fun begins. The metal planing form is adjusted to follow the taper of the rod and each strip is hand planed so that it consistently matches the others. Each rod section consists of six consistent strips of bamboo glued together. I enjoy fly fishing but every once and awhile I head out on the boat with a spinning rod. The last few times I went fishing with my trusty fiberglass spinning rod I knew something was missing. I missed the pleasure of looking down and seeing that beautiful amber bamboo in my hand. So, I pulled out a rod design a friend had give me last summer for a bamboo spinning rod based on an Ovis taper and went to work. The process was pretty much the same as a fly rod with the exception of the guides and reel seat. In addition, I picked up a classic German made D.A.M. (Deutshe Angelgeräte Manufaktur) spinning reel at an antique shop this summer as the perfect accompaniment to the rod. After a few practice casts I think I’m really going to enjoy heading out to one of the local lakes next summer. 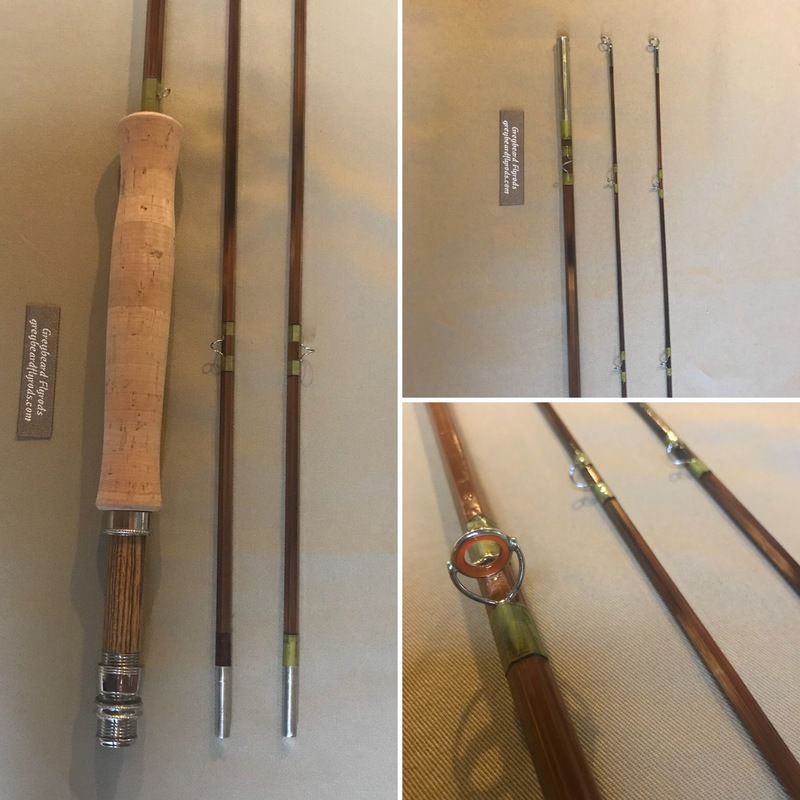 This five weight bamboo fly rod is handcrafted from Tonkin bamboo and is seven foot six inches in length and has been donated to the RFC Volunteer Fire Departments Silent Auction on Sunday July, 17. The rod is designed to be a good all purpose rod, perfect for northern Michigan rivers, lakes and streams. The rod has a custom reel seat made from padauk wood and nickel silver reel seat hardware. The rod has an agate stripping guide and the guides are wrapped in maroon silk thread. Also included is an aluminum powder coated rod case with brass end caps and a cloth rod bag. I started on a new fly rod this weekend. When you’re crafting a fly rod out of a culm of bamboo the first several steps are the same regardless of what final rod you are creating. Step one, split the bamboo – first in half then dividing it into progressively smaller sections until you are down to a minimum of 12 strips about 1/4 to 3/8 inch wide. Step two, rough planing – using a hand plane work the strips down to about a 1/4 inch wide. Step three, file the nodes – nodes are where the leaf comes out of the bamboo. There is a ridge there that needs to be filed smooth. Step four, pressing and straightening – even after filing many of the nodes will have a distinct bump. To remove this you heat the node over and electric heat gun which will soften the fibers. Then you press the node into a vice to press it flat. After all the nodes are pressed you check the strip for straightness. Any kinks or sharp bends in the strip are removed by a series of heating and bending. Step five, rough beveling – since the rod is made up of six individual pieces glued together to form a hexagon shaped pole each strip needs to end up at a 60 degree pie shaped angle. This rough beveling can be done with either a router or surface planer with a special jig. I use the surface planer method. Step six, baking time – once the strips are rough beveled they are bound onto an aluminum form and baked in hot air oven. This process removes any excess moisture and straightens the strips for final planing. Now comes decision time. The next step in the process is to set the taper of the rod and do the final hand planing. This is where you have to make the decision of what rod you are actually going to build. So what’s next? I finished wrapping “Gill” for my nephew. This is a 7’6″ – 5wt built to a Warra Grande Experiment tapper. A great all around fly rod. Great for chasing after blue gills or trout. We had the opportunity to do a little spring fishing in down in North Carolina on the Mills River. A beautiful weekend and nice for us northerners to get an early taste of spring.